HomeAll PostsWE ARE THE CHANGE! ENOUGH IS ENOUGH!! Fr. Daniele shared with us the story about his participation in a “March for Our Lives” in Washington, DC on March 24, 2018, in which around 800,000 young people from around the United States joined the march to express their sympathy with the victims and survivors of mass killings in several schools in the US. They urged the U.S. federal government for the abolition of automatic weapons of assault, prohibition of the sale of high-loaders bullets, etc. There were 13 deaths at Columbine High School in the state of Colorado; 26 at Sandy Hook in the state of Connecticut; 17 at Marjory Stoneman Douglas in Florida. Over the past twenty years, from 1999-2018, there have been more than 200 mass shootings that, over time, have grown in numbers. This has led unequivocally to a continuous pattern of massacre in the U.S. experience, and the accompanying shock and trauma for victims in both schools and public places. In the United States, the names of places or schools are always remembered with numbers of dead or wounded that these attacks have caused. What is not readily reported is the collateral damage of each crisis, mainly American. Compared to other nations it is clear: there is no other country like the U.S. more prone to violence and killings using weapons against its own citizens. And it is the case of the young people of Marjory Stoneman Douglas School, in Parkland, Florida where this past February 14, Valentine’s Day, there was the most recent of the mass killing attacks that have raged in several schools since 1999. It is a school for whites and Latinos of middle and upper class, the sort of which had never experienced such an attack. In fact, no African-Americans were on their list of victims or the injured. The murderer, a former student at the school and expelled a year before, was a young white, 19 years, named Nikolas Cruz with various personal and family problems. He boldly and coldly completed this attack in 6 minutes and 20 seconds by downloading several rounds into the crowd of his helpless and terrified peers. He used the infamous AR 15, an automatic machine gun that shoots 45 rounds per minute. This gun was used in all the massacres of recent years both in American schools but also at other public events. It’s a weapon that should be used only by the military but is being sold regularly to all buyers in sports stores and department stores and to those as young as 18 years. From these young victims of Parkland, Florida came the cry of revolt that is changing the spirit and inspiring the desire to “fight” the chilling stillness toward this terrible national problem. It’s a problem that has been decimating the younger generations and the future of the country for over 20 years. This is only the tip of the iceberg that is much larger than the typical malaise often experienced by America’s black and Latin Americans since it is also now an experience of the white upper class. It is becoming increasingly difficult for each state’s law enforcement agencies, security and protection details to contain society that is based on violence at various levels. In addition, the resulting injuries, diseases and thousands of suicides that this violent, competitive and consumerist society causes affect not only future generations but the older ones. There are signs of decline of human values and principles that have devolved into a growth of intolerance, injustice, racism, violence, imprisonment and deliberate killings by police and by individual citizens. And the people themselves are increasingly armed with the latest rifles on the market. The mass shootings in predominantly white schools attract the greater attention of television, radio, journalists, politicians and lawyers. But a recent study of the daily Washington Post, showed that assaults, injuries and killings are three times higher in schools of young African-Americans (16.6% of citizens in the country). And are two times greater in those predominantly Hispanics (19.5% of citizens in the country). The data show us how minority communities are the most tormented and at higher risk than the white ones. But the national attention and collected information are especially focused on those of white race, color and culture. In the last 20 years of such violence and disasters occurring in educational institutions there is a clear trend for those to declare progress on the values of inclusion, progress, democracy and freedom. But values such as these become privileges only for some and not for all. Many of the shootings taking place in schools of African-Americans or Latinos, are typically not even reported by newspapers or media houses and if they are reported, it is done superficially. According to this research, on average there were 10 shootings per year, beginning with 1999 at Columbine, with a minimum of 5 attacks in 2002 to a maximum of 15 in 2014. An extraordinary crescendo when you consider that only in these first three months of the year 2018, there have already been 11 shootings, the last one in the middle of March at Great Mills High School in St. Mary’s County, Maryland, just a few weeks after the one at Parkland, Florida. A 16-year-old girl was killed by her former boyfriend, a 17-year-old, who committed suicide soon after. These attacks occurred in 36 States of the 50 of the United States of America, both in big cities and smaller ones, in the countryside and suburbs. Additional research shows that in schools, from 2005 to 2018 (Parkland, Florida), there were 526 people dead, 1424 wounded, and several hundred assaults. It also showed an ever-growing trend, of increasingly updated and more lethal types of weapons being used. And increasingly with solitary killers. We must take into account that in the U.S. there are over 357 million weapons (source: Congressional Research Service) that are in the hands of citizens and not of the army. This nation has 320 million citizens, representing 4.4 percent of the world’s population. But American citizens have 42 percent of world weapons purchased by individuals. But another percentage draws attention: only 20% of the American population has about 65% of the total number of arms in the country. This means that there are now fewer people having guns than a few years ago but the same have many more which make the situations increasingly more dangerous. These are hand and light weapons, super automatic, but also increasingly lethal and sophisticated, the latest productions. And since the business of arms has a large turnover of billions of dollars each year the National Rifle Association (NRA) continues to sponsor the sale of new small arms in the country. But the same organization and the most important lobby sells and exports billion of dollars in small arms and heavy weapons worldwide. When citizens wonder who brings arms in Syria, Saudi Arabia, Libya, Africa and the Middle East and other parts of the world, they should not forget that the U.S. is the world’s largest producer of weapons, followed almost closely by its “great frenemy Russia”. In the new era of “Trump and Putin,” it becomes increasingly difficult to understand the limits and the boundaries between these two leaders in power. What is certain, the “tomfoolery” is at the expense of bringing world politics closer to global security, peace, and the integral development of people for a common good. And with sound diplomacy and democracy for all. Instead it has become increasingly dangerous in all areas: that is, the economic, social, military and environmental. Not surprisingly Trump recently has again signed an agreement with Saudi Arabia for another billion dollars in weapons. This one follows the agreement concluded on May 2017, on his first visit to Saudi Arabia as President of the United States, where he signed a colossal agreement of “110 billion dollars” for weapons. But that should become “350 billion dollars” over the next 10 years. Certainly we are witnessing a devastating power for any country and continent of the world! And try to guess where they’re going to end up, these weapons, in the next few years? Who is going to use them? The Middle East and Africa are always the favorite target of American world policy and its Saudi allies who fight their own war, both military and also economic, in these two areas of the world among the most tormented and, at the same time, abandoned of the universe. They are proxy wars for control of peoples and nations, and especially the great natural resources that abound in these continents versus the military and economic power of Russia and China. For the last 250 years, the history of the United States of America, shows the “importance” of creating a weapons arsenal and this extends to the present, and especially the future. It was almost a “vocation,” these weapons and the ensuing violence, that was inherent to the ancestral history of conquering the uncharted territories of the famous “Far and Wild West.” And of course came with this the decimation of American Indians, the Civil War, the use of slaves and then the abolition of slavery in the South. But also in “building” what eventually would become an increasingly American dominance in the world, whether political, economic, cultural and military. It is interesting to note that deaths from firearms and firearm-related accidents compared to those that took place during the U.S. wars during its founding history, and wars conducted by soldiers in other parts of the world, are clearly greater than the latter. And even in a much smaller time period. In fact, from 1968 to 2015, there were 1,530,000 gunshot deaths in the country. While, from 1775 to 2017, 1.2 million victims were killed inside and outside the country (NBC Source: Centers for Disease Control and Prevention, U.S. Department of Veterans Affairs, www.icasualties.org). Taking a closer look at the National Rifle Association (NRA), its interests are not limited only to national but also to international sales. It is no coincidence that the NRA has good relations with President Trump and many parliamentarians not only Republicans but also Democrats. This association sponsors multi-million dollar political campaigns of candidates on the state level. Then you pay duty helping the NRA to obtain what is of common interest that is as much profit in the production and sale of arms both at home and abroad. This dynamic was the one that always put down any initiative by former President Barack Obama and the Democrats during the period of his presidency. They couldn’t push through any changes to amendments for greater small arms control in the country. The drama of mass assaults in schools and public buildings, as we saw, continued to grow at absurd levels. But no one had managed to unblock this situation of immobility. The NRA had always been able to push through and “motivate” both political representatives and the media on the importance of arms for personal and national defense. This in spite of Columbia University research that systematically analyzed 130 studies conducted in 10 different countries, including the United States, which confirmed even more that arms control in these countries always resulted in the best safety results. Both in the minor numbers of dead and wounded but also decreases in reducing the sale of the weapons and therefore greater safety and stability for all. 100,000s of demonstrators gathered at the Capitol Hill in Washington, DC on Saturday, March 24, 2018, and in other 800 American cities and around the world. 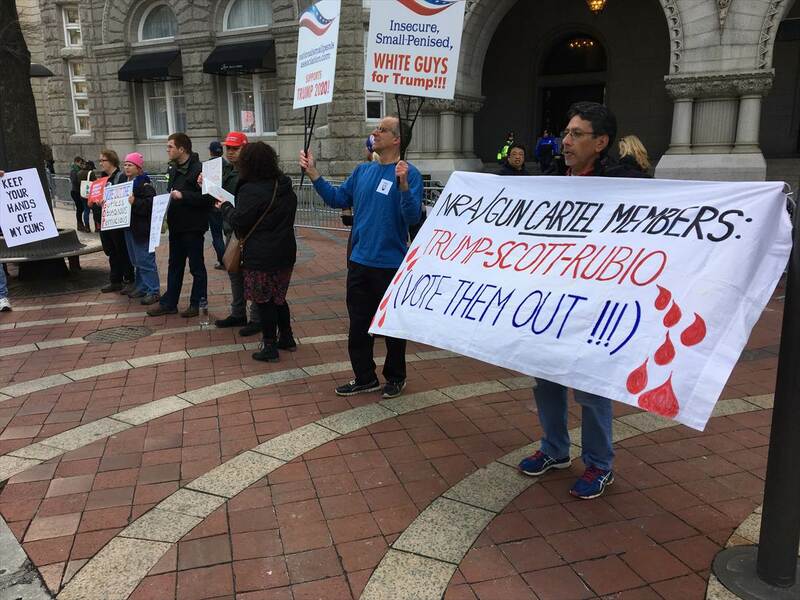 They came to protest, asking for action against gun violence and greater control and to remember the deaths of the 17 friends students in Parkland, Florida as well as the thousands who died innocently. They were seeking a future free of this for new generations. I chose to be with them to show my solidarity and closeness at an important moment of pain but also a time of courage and desire for redemption It was to honor the common fight for all children, young people and common folks who were swept away by a violence across the country. It seems it has devolved into a country that can no longer control the weapons it produces, either internally or externally, with the large number of international exports. It is resembling a boomerang that backfires, and a society that condemns its future by annihilating future generations violently and oftentimes consciously. These hundreds of thousands of young people who came to Washington from across the country, but also the many others doing the same thing in other cities, were very conscious of what they were implementing and carrying on. So many just young teenagers who had to grow up fast to face life that was playing out in a cold and violent way. The very strong response this time, after so many previous massacres of the last twenty years, was vehement and determined. 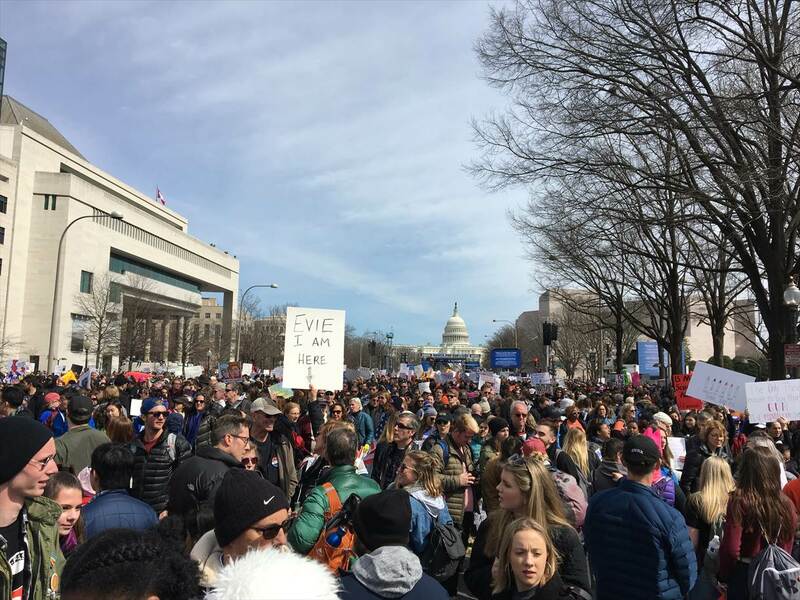 There were nearly 700-800.000 people at the “March for Our Lives” in Washington, D.C. on a sunny and beautiful day, full of colors and excitement. Hordes of people, not only young people but their families. Many banners and slogans with much creativity, direct messages and humor. But with a common slogan: Enough is Enough! That the immobility and callousness of politicians are no longer tolerated! The movement of these young survivors of the massacre of Parkland/Florida had been able in a month to mobilize all these thousands of people from everywhere. Millions of people were mobilized even across the country and abroad. 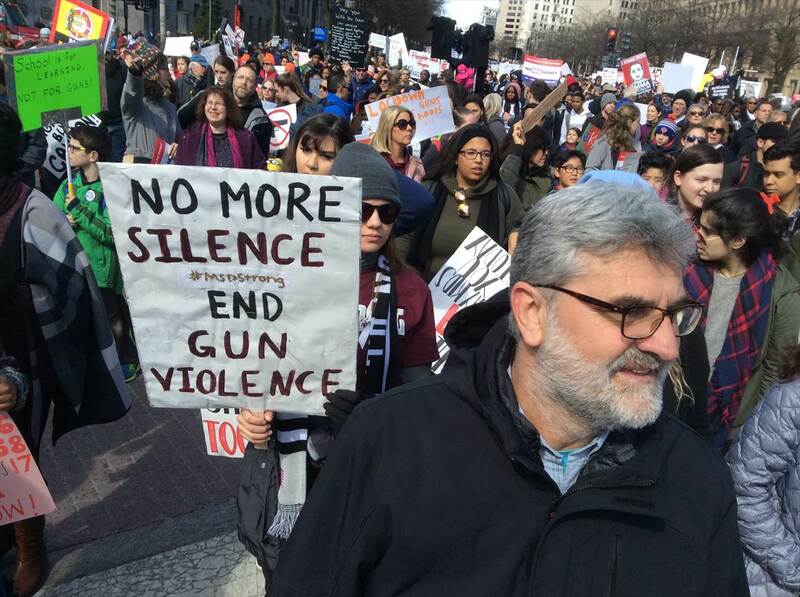 This historic “March for Our Lives” was conceived and organized to ask the American government to promote and urgently approve more stringent laws for the sale and use of weapons in the country. To stop the epidemic of violent assaults and killings in the schools of the country, condemning children, adolescents and youth to be victims sacrificed at the altar of the idol of weapons. This event was made possible through the sponsorship of people like Oprah Winfrey, George and Amal Clooney and other American celebrities who donated for this and other initiatives. This allowed the multitudes to have a channel where they could shout out their fears and disappointments. But also shout the dreams, the hopes and the right to life to President Trump, the Administration and to the world that life is far more important than weapons, possible war and widespread division. Despite many supporters during these early months, there are also different voices opposed to abolition of weapons and cancellation of amendments. They launch verbal attacks that are sometimes defamatory and offensive towards this spontaneous movement of young people, many who are the victims. But the youth proceeded with courage and determination despite false accusations and inconsistent views expressed by politicians, television personalities and by leaders of the NRA and its supporters. The youth of the Parkland school recalled their experience at this March as did all the young people representing different schools in the country. It was doubly resonant for those sharing in the same kinds of painful experiences like theirs. And they were many! African-American and Latino students are among those who experienced violent events, killings and injuries in a more considerable way than those schools for young whites. And even these young people from cities across America showed so much determination and unity of purpose with the pupils from other schools. A single and heartfelt cry of pain took flight for the fight of the common good. Because the demand for safety and security is not just for the schools where they study and where they should be safe from violence and criminal acts, but for many of these young people just getting to and from school is a daily danger. In everyday life the struggle for survival against weapons that kill is an inevitable via crucis. An evil that is really bigger than what is shown to the world. Naomi Wadler, 11 years old, an Afro-american was the youngest among the speakers. Like all the other young people, she entertained the crowd with a well prepared speech, great eloquence, fluency and competence. All the speakers gave speeches that although just a few minutes were well prepared and studied, without wasting time or glorifying themselves. They remembered their friends, teachers and relatives killed and sometimes crying bravely before a silent crowd. And so this heavy responsibility falls on the youth of today to lead this new struggle. As well as other young people of other generations in the past who have taken upon themselves responsibility for demanding that their fellow Americans take heed regarding the murders, the curses and absurdities. They were led by the spirit of protest. That spirit was there when in 1960, students of four colleges staged a sit-in at a lunch for whites only at Woolworth’s Department store in Greensboro, NC. The same spirit was there in subsequent years when white and black students travelled together on buses and trains into the Deep South of those states violating the famous segregated Jim Crow’s laws. The same spirit inspired others in 1963 in Birmingham, Alabama, when students from elementary to high school marched together leaving their classrooms in protest against racial segregation and earned the nickname “the guys of the crusade of 1963”. And how can we forget the spirit that inspired the marches and struggles of young people against the war in Vietnam and in Southeast Asia, against nuclear weapons and environmental degradation. Many young people “David against the so famous Goliath!” Dreams and creativity against force and violence! So today these young people are taking responsibility in their hands to shake and stimulate this system, provoke the consciences of adults, politicians and a society too indifferent. A society that has been passive to raise even a finger against terror when it could also take away the lives of their children and grandchildren. To open their minds and hearts beyond its geographical borders to the world where there are millions of children, youth, women and elderly who live these daily dramas without having seen days of peace, stability and security for the future of all generations. Some say that this movement will melt like snow in the sun. Someone else instead deeply believes that these children and young people are representing “generation victims;” specifically, two decades of violence and political immobility; they are a great resource for the future of the country and even the world. 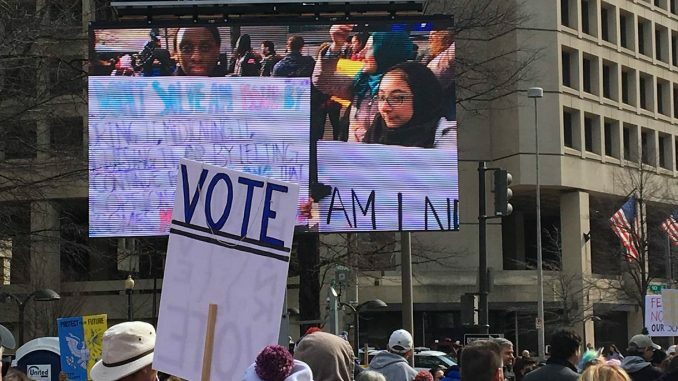 It’s a return of young people to a “committed political consciousness.” Their will is to change the status quo and the system that is slowly becoming a cancer that kills the American society drifting from the values that it has always flaunted proudly: democracy, freedom, integration and openness to the peoples of the world. But Parkland students and their peers in the country have already had a big impact and fruits from this widening debate on guns and violence. The legislative members of the State of Florida, a state that usually has been a laboratory for the indiscriminate use of arms, has approved in March the first law for gun control. For more than 20 years this has not happened. This measure was possible by the pressure of the students who survived at Stoneman Douglas in Parkland, Florida. And some measure has already been foreseen at the level of Federal Government. But it’s still not enough! The youth movement, will continue to visit many other schools around the United States to bring solidarity and support to the millions of students who live their own experiences. They will coordinate with them and strengthen this movement that is just at the beginning. It is a very interesting prospect for political awareness and commitment and is vital for their future. There was on April 20, 2018 a national march to mark the anniversary of the first attack on a school in 1999 at Columbine High School in Littleton, Colorado. Other marches will follow in many of the 50 U.S. capitals across the great continent of North America. Will it be only a dream or become a welcome reality?